A searing investigation of the honey market by Food Safety News found that 76% of all honey bought at grocery stores were treated with a process called “ultra-filtration,” which removes not only impurities like wax, but also all traces of pollen. And of the types of brands at grocery stores, the ones that were far-and-away the most likely to be ultra-filtered were generic brands. There are issues with ultra-filtration in general. Many believe that pollen, and other so-called “impurities,” are actually beneficial to human health, and make honey a better choice than rival sweeteners like sugar. And there doesn’t seem to be any serious benefit to the process; it’s expensive and doesn’t significantly improve shelf-life, even though some manufacturers claim it does. But according to FSN, the biggest reason to avoid ultra-filtered honey is that pollen is the only sure-fire way to trace the source of honey to a geographic location. As a result ultra-filtered honey is often used to mask the shady origins of certain kinds of honey, especially Chinese honey, which is subject to heavy import tariffs on account of its frequent contamination by heavy metals and illegal antibiotics. Chinese honeymakers ultra-filter their honey, and then ship it through byzantine paths, to sneak their sham product onto American grocery shelves without being hit with a tariff. -100 percent of Winnie the Pooh sold in Walmart stores had all pollen removed. -100 percent of honey from individual packets from KFC and McDonald’s had all pollen removed. -77 percent of honey from big box stores like Costco, Sam’s Club, and Target had no traced of pollen. -100 percent of honey from drugstores like Walgreen’s and CVS Pharmacy had all the pollen filtered out. He did find out, however, that honey purchased from co-ops, farmers markets and stores like Trader Joes contained the full amount of original pollen. 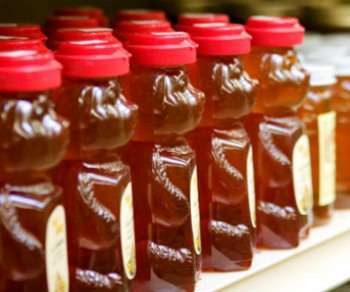 Many have called for the FDA to do more to prevent adulterated and smuggled honey from landing on grocery shelves, but the group has so far shrugged off the burden. The EU, for its part, just changed labeling regulations to require that honey containers list “pollen” as an ingredient, when it is one, despite the objections of some honey farmers, who call pollen intrinsic to their produce. One ounce of raw honey contains approximately 20 vitamins, 18 amino acids, 16 minerals, and a ton of antioxidants and phytonutrients. Raw honey is an antibacterial, antiviral, and antifungal substance. It is also highly nutritious. It contains significant amounts of B2, B3, B5, B6, C, magnesium, potassium, calcium, sodium chlorine, sulphur, and phosphate. In the meantime, though, worried consumers do have a good option: buying honey from farmers’ markets and natural food stores. The FSN investigation found that few, if any, of the honeys sold there had been subject to ultra-filtration. I have seen some local honey for sale on the roadside and there is at some stores, but it just ends up being more convenient to get the PC honey - many supermarkets are carrying the PC brand (private label) or Loblaws house brand. There are Loblaws throughout Western New York and Pennsylvania. "PTB believing in it and embracing it themselves, as it is anti nature / god / normality is worth considering, for sure - and a very good possibility too. I'm sure that a hour or two online should reveal some hives in your local area - I'm guessing Canada, as President's Choice makes me think of Loblaws (I have family in Ontario) - honey is also THE ultimate survival food, it literally keeps FOREVER. The question is this - is GMO simply a weapon against the masses, or do the PTB believe in it and embrace it themselves as it is anti nature / god / normality - and they believe they can do better? And thank you too. Although I've read about the correlation of honey (local) and the elimination of allergies; I'm very encouraged to find out that it had such a positive effect on your asthma, however - and i will pass this news on to others. I have to be honest and say that I do not purchase as much local honey as I should. Mostly out of convenience; I buy the President's Choice (PC) Organics Brand at the grocery - The one which I usually buy, is called Pure Honey (375g or 13oz) its a blend of Australian and Brazilian 'unpasteurized' honey and I usually get it for around $4.60 per bottle. PC also has a few others of this Organic honey; Manuka, Pure Honey, Orange Blossom and Acacia. I need to make a better effort of knowing where i can buy local honey right from the hives. I'll bet anyone, that all those in the NWO pact, are all eating organic (natural) foods, and nothing that's made by Monsanto, and or Big Pharma; ractopamine pork? Thanks Christopher - about 16 years ago, I virtually eliminated my allergies and asthma by eliminating dairy products from my diet and consuming local honey. Your local bee keeper and his hives ensures pollination of the local flora thus supporting the local eco system. That means you can grown your own veggies and fruit. We need to fight the NWO on a local level first. Very good advise DTOM - especially supporting the local bee keeper. Buy local honey! If you have allergies, consuming local honey will allow you to build up an immunity to the pollen of the area locale. Support your local bee keeper!